TagSpaces is an offline, open source, file manager. 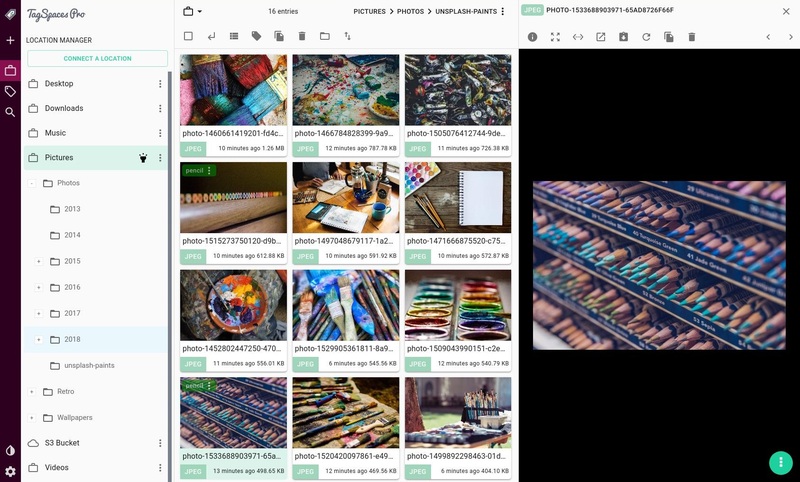 Organize your photos, ebooks, music, recipes or invoices in the same way on almost every operating system. We currently support Windows, Linux, Mac OS and Android. In contrary to the most file tagging applications, TagSpaces does not persists the tags in a centralized way. As a consequence, the added meta information is not vendor locked. The absence of a database, makes syncing of it easy across different devices with services like Dropbox or Nextcloud. TagSpaces features basic file management operations, so it can be used as simple file manager supporting tagging of files and folders. With the help of tags you can do research better or you can manage your personal projects and todo lists. TagSpaces products can be used as alternative for Evernote's note taking and web scrapping functionalities. You can create and edit notes in plain text, markdown or HTML file formats. With our web clipper for Chrome you can save web page content in HTML or MHTML formats for later use, allowing you to use the application similar to the many "read in later" services. Preserving the content as it is by the time of the saving. By saving of a given web pages, its URL is embedded into the created file, so you are have automatically a bookmark to it. This allows you to use TagSpaces as a bookmark manager. You can create To-Do lists and organize them in a kind of offline personal wiki for tracking your projects, ideas or memories. Navigate through your local file system in a convenient and responsive user interface, familiar from the modern cloud based file storage services. Preview your digital photos, listen your local music and video content, open PDF documents and collected web pages. The list of supported files types is constantly growing. You can use TagSpaces to organize your e-book library, containing for example PDF or EPUB documents. TagSpaces has a modern user interface based on Material Design paradigms. The themes can be switched with just one click from application's main window. The source code of TagSpaces core is open source, published under the AGPL license. The application is designed to be easily extended with different extensions for visualization of directory structures or for opening of different file types. Most of the these extensions are published under the MIT open source license. TagSpaces is running completely offline on your computer, smartphone or tablet and does not require internet connection or online registration. You can still use platforms like Nextcloud, Dropbox or Syncthing in order to sync your files between devices. The application supports adding tags to files, in a transparent, not vendor locking way. You can tag your files by a simple drag & drop actions. You can organize your tags thematically in groups, for example the tag group "family" can contain tags with the names of your family member, useful for photo tagging. In addition you can assign different color to your tags. The application support searching for files in your current location. It can be searched explicitly for given tags. TagSpaces features a set of basic file and folder management operations such as create, rename, move and delete. The application can be extended with additional viewers and editors for different file types and perspectives for visualizing of folder structures. @tagspaces - finally, a simple elegant cross-platform file tagging solution. I'm switching from Evernote to @tagspaces + @ownCloud so my data is stored in my own machine. @tagspaces Discovering TagSpaces today and install on my @ownCloud. It's wonderfull. Thanks ! @tagspaces Thanks a lot for the development of tagspaces. I am really glad with this piece of software. Definitely. TagSpaces also supports storing metadata in per-directory hidden folders, which is probably the best way to go. Help us change the way the world is organizing files. Spread the word!